FOREX: Hopes for China and the US to restart trade dialogues soon, higher growth projections by the Bank of England and the ECB’s optimism for wages and inflation in the EU reduced the demand for safe-havens such as the yen, sending dollar/yen to 112.07 early on Friday for the first time since August 1. Yet, the upside did not last for long, with the pair dropping back to 111.70 (-0.11%) after the Japanese Prime Minister, Shinzo Abe said that it is “not alright for monetary easing to continue forever”. The dollar index which measures the dollar’s strength against six major currencies was fluctuating around 94.46 – a touch weaker on the day (-0.06%). In the Eurozone, July’s trade deficit narrowed to 17.6 billion euros from 22.5bn previously, while wage growth increased by 0.1 percentage points to 1.9% y/y in the second quarter. Euro/dollar extended yesterday’s rally above 1.1700 to reach a fresh 2-week high at 1.1720, though it soon fell back to 1.1697 (+0.08%). Pound/dollar changed hands higher at 1.3112 (+0.04%) and was set to post its biggest weekly gain since March, while euro/pound was steady at 0.8917. In antipodean currencies, aussie/dollar eased to 0.7189 (-0.04%), while kiwi/dollar recovered further to 0.6577 (+0.17%). In emerging markets, the Russian rouble was performing strongly against the US dollar, surging by 0.94% following an unexpected rate hike by the Russian central bank on Friday. Policymakers raised rates by 25bps to 7.5%. STOCKS: European stocks were flashing green on Friday at 1100 GMT, though they were printing moderate gains, with energy and consumer cyclicals leading the pan-European STOXX 600 and the blue-chip Euro STOXX 50 up by 0.17%.and 0.13% respectively. The German DAX 30 climbed by 0.24%, the French CAC 40 increased by 0.25%, and the Italian FTSE MIB was flat. The British FTSE 100 added 0.24% to its performance, while futures tracking US stock indices such as the S&P 500, Nasdaq 100 and Dow Jones were pointing to a positive open. In Asia, equities closed higher apart from Shanghai’s composite index. COMMODITIES: Crude oil prices were on track to finish the week in positive territory, as concerns over supply tightening fuelled further by larger than expected downfalls in US oil inventories helped the crude market to pick up steam this week. On the other hand, worries about renewed US sanctions against Iranian oil exports were also weighing on sentiment. Iran’s second best oil client, India said that it will reduce monthly purchases from Iran in September and October. WTI crude and Brent were last seen at $68.87/barrel (+0.41%) and at $78.35 (+0.22%) respectively. In precious metals, gold was also set to finish the week higher after two straight weeks of losses, edging up to $1205.2 (+0.39%). Looking at today’s pending data releases, retail sales out of the US at 1230 GMT are expected to grow by 0.4% month-on-month in August, by less than in July when the measure posted growth of 0.5%. Core retail sales that exclude automobiles are projected to expand by 0.5% m/m versus 0.6% seen previously. A few minutes later at 1315 GMT, the US will be on the receiving end of industrial production figures for August, with analysts seeing industrial output rising faster by 0.3% compared to July’s increase of 0.1%. Manufacturing output, a subset of industrial production, will be also generating interest. At 1400 GMT, the University of Michigan will be delivering preliminary readings on consumer sentiment and inflation expectations for the month of September. Estimates on consumer sentiment stand at 96.7, above 96.2 printed in the previous month, while the survey related to inflation expectations will attract interest after the US CPI stats clocked in lower than analysts estimated on Thursday. 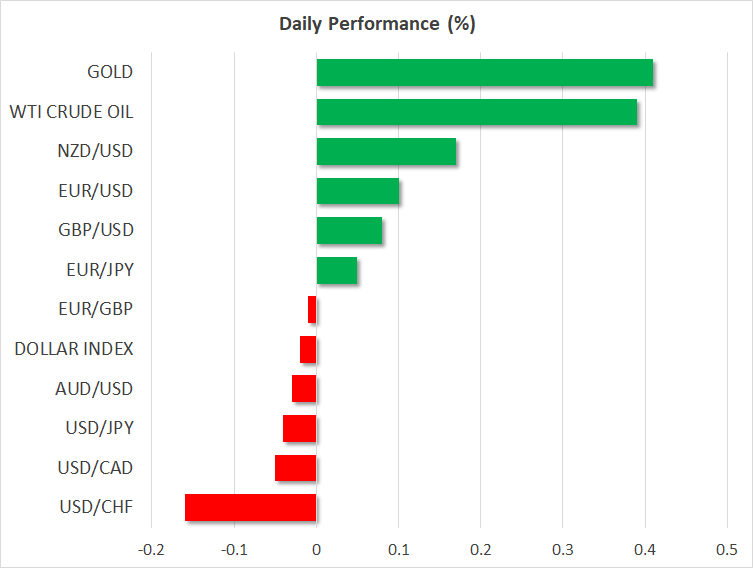 If the above data beat expectations the US dollar could recoup today’s losses. In energy markets, investors will keep a close eye on the US oil rigs count issued by the Baker Hughes company at 1700 GMT. In terms of public appearances, Chicago Fed President Charles Evans and Boston Fed President Eric Rosengren will give a speech at 1300 and 1400 GMT respectively. Any news on the trade front could spur volatility to the markets. Potential Brexit headlines could move markets too. Next articleGold Looks Mostly Neutral in the Short-Term; Bearish Medium-Term Outlook to be Challenged?